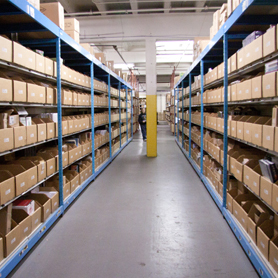 Looking for a fulfillment center that charges only for the inventory storage space you actually use? Many order fulfillment companies charge high storage fees, require minimums, and even penalize you if your inventory is stored for too long. At eFulfillment Service (EFS), we not only provide a low-cost inventory storage solution, our friendly pricing means that you pay only for the amount of storage space you use, whether it’s 10 pallets, one half pallet, or just 1 cubic foot. On top of that, we will never penalize you for slow-moving merchandise. eFulfilllment Service operates nearly 200,000 square feet of space in our clean, secure fulfillment center. Supported by a strong technology backbone and a friendly, experienced operational team, our facility protects and organizes your products for safe, secure inventory storage and fast, efficient eCommerce fulfillment that easily scales with your growing business. Below are some of the additional features and benefits of our eCommerce fulfillment center and technology. IT disaster recovery plan (available upon request) outlining immediate and detailed responses to events ranging from electrical outage to server failure action plan. With our web-based fulfillment software, we will provide you with constant visibility over your inventory and eCommerce orders, and our friendly, knowledgeable staff will work closely with you to coordinate freight shipments and ensure that your merchandise is handled properly from the time it hits our dock, to the time it is shipped to your end customers. Discover why so many online sellers worldwide put their trust in eFulfillment Service. Get a free warehousing and fulfillment quote today.